It’s tough to describe the millennial lifestyle when you’re not a millennial. To boomers and other older generations we’re lazy, entitled, not buying homes, not having kids, and are the murderers of dozens of industries including TV and movie-going—something that we here at Paste Comedy just couldn’t condone if it was true. But as any millennial or well-read person can tell you, there’s more to “millennials killing everything” than entitlement. We’re aimless because we came of age in the middle of the worst recession in decades. We don’t want to buy homes because we don’t make enough money to enter the housing market and have too many student loans to even imagine having children. Many of us have degrees we don’t know how to use, live in cities that are becoming more unaffordable by the day, are stuck watching older generations ruin the world, and are just too cynical and mentally ill to try and find a way out. The lives of the maladjusted have always been a prime well for comedy, which is why sitcoms have always told the stories of the dysfunctional. These days sitcoms are seen as antiquated, but millennial sitcoms straddle this line between old and new, creating 30-minute stories that are confined to its runtime and based on the plight of the late 20s, early 30s struggling adult. Doesn’t help that they’re created by millennials who often draw from their personal lives to give the shows a semblance of realism. Some of the first to really hit the mainstream were Girls on HBO and Broad City, the latter starting out as a semi-popular but underground webseries in 2009. It made the leap to Comedy Central in 2014, and is airing its last episode tonight. Over the course of Broad City’s five seasons viewers learned just how watchable the millennial journey is. The series’ two heroines, Ilana and Abbi, jump around from job to job, smoke copious amounts of weed, and flounder around NYC waiting for things to go their way. Episodes are based around mundane scenarios, like how Abbi has to pick up a package for a neighbor, or how Ilana takes on too many temp jobs. The two get into random shenanigans that get resolved by the end of the episode and move onto the next wacky scenario, all while not exactly growing or learning—at least during the first few seasons. This shouldn’t be revolutionary, but somehow it was. Broad City is just one of many millennial sitcoms that have become the norm on networks like Comedy Central and on streaming services like Netflix. Shows like The Other Two, Corporate, You’re The Worst, the aforementioned Girls, Love, Master of None, Shrill, and countless others have based themselves around some millennial characteristics and story points: aimlessness, existentialism, the downfall of the traditional workplace, drug use, the rise of social justice issues, and this deadpan delivery that separates them all from the sitcoms of yesteryear. Most importantly, all of these shows (along with some hour-long comedies that I’m choosing not to include in this piece) take the experiences of their creators and turn them into relatable and grounded but absurd comedies. Broad City is certainly not the first of its kind, but it came around early enough that it became a cultural touchstone. It’s easy to see why. The stories of Ilana and Abbi are wild and absurd, but intensely relatable. Sometimes the two of them just do drugs and explore New York for 30 minutes. Other times they have conversations about how to live their lives. Maybe they should just move to Florida and become old retirees because life is so much cheaper and easier in racist, gun-toting Florida. Maybe they should go their separate ways. Abbi and Ilana (the characters, not Abbi Jacobson and Ilana Glazer, who have brought the characters to life for nearly a decade) are exceptionally dysfunctional. Abbi doesn’t know how to act in just about any situation and somehow doesn’t know how to read. Ilana has an over-the-top, grating personality and is bored by almost everything. They’re both fiercely codependent. This makes them perfect sitcom fodder. Sitcoms, as a genre, tend to be about broken people and general dysfunctionality. Even the most standard of sitcoms—let’s say Friends—are based around the tribulations of the kinds of people that tend to get themselves into comedic or awkward situations. Friends can be considered the pre-millennial sitcom in a lot of ways. While the 20 and 30-somethings at the core of the show might struggle in work, love and in life, there was always something free about them. They weren’t bogged down so much by societal collapse. When their characters evolved, they did so toward marriage and children, which were the aspirations of the previous generation. But millennials aren’t getting married or having children, so what is there to strive for? These ‘90s sitcom characters had problems with dating, not with paying off their student loans. The protagonists in other millennial sitcoms like The Other Two and You’re the Worst are working towards relationships, but the onus is on personal development. What will you do with your life? How do you become the best version of yourself? All of that is wrapped in an over-the-top, sometimes edgy exterior (especially You’re the Worst), but at the core of every character is self-discovery. Broad City , considering how Abbi and Ilana managed to stay relatively static for the first couple seasons, does have some aspirational elements, but the goals are different. Abbi and Ilana are working towards stability and personal growth, which all comes to a head in the final season. Episode 5, “Artsy Fartsy,” is especially important, as both Abbi and Ilana have adventures separate from each other. This has been the case before, but what happens with both of them is life-changing in different ways—Abbi goes to a museum party and has a queer experience while Ilana breaks up with Lincoln for good. One of them has a positive night while the other is not seeing the light and the end of the tunnel. Either way, both of them are moving on. Throughout this last season, Abbi and Ilana are moving away from each other, and viewers are left to wonder if all of this is for the better. Abbi’s need for creative fulfillment in her art and relationships outside of Ilana is the catalyst, and Ilana’s inability to deal with that is both pathetic and tragic. As Abbi sets plans for her future, Ilana is left not knowing how to deal, even as she decides she wants to become a therapist—a huge move for somebody who jumped around from meaningless job to meaningless job for five seasons. The series’ penultimate episode “Along Came Molly” is all about this impending change. Instead of showing us emotion, it all finally comes out in an intense conversation, one that the two needed to have a long time ago. 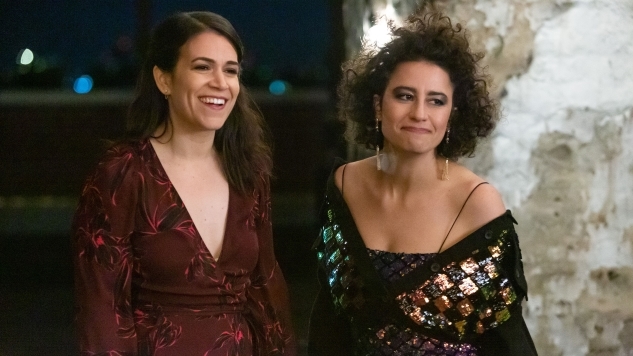 It drives home that the series has, yes, always been about the random adventures of two consistently-stoned New Yorkers, but it’s also been about the friendship between Abbi and Ilana and how they both make each other better and hold each other back. Broad City is secretly a coming-of-age story about two millennials who are becoming the best versions of themselves. The destination of most millennial sitcoms is about self-improvement in the face of societal oppression, whether that’s due to your race and gender, or just your economic standing in a fucked up workforce. You’re not going to get a perfect, happy ending, but it’s (hopefully) going to feel satisfying. In Shrill Aidy Bryant’s character learns to deal with her size and become comfortable with herself despite a world that makes her hate herself. In The Other Two, Brooke and Cary need to not only find their place in the world surrounding their now-famous brother, but also how to put years of familial trauma behind them. In its final season, Broad City becomes the ultimate millennial sitcom by doing just that, tying everything up in a bow and setting it off for a new destination. It may not be the perfect, fairytale “I got off the plane” ending like we got with Friends, but it’s important to not only the characters but to the audience of millennials who are facing similar obstacles. Broad City ’s series finale airs on Comedy Central at 10 p.m. ET/PT.